Growing up, I loved our World Book encyclopedias. I would often pull out a volume at random and flip through it, stopping when I found an article that caught my interest. That article would usually lead me to another subject, which would lead me to yet another. In this way I would follow the old-school links from one subject to another, much as we do today by clicking HTML links on the internet. While I enjoy making those online journeys, they don’t have quite the same mystique as a trip through the encyclopedia. When I was able I bought my own set of encyclopedias, and kept them long after most people had discarded theirs. I taught my kids to use and love them, and although neither I nor they now own a set, we have fond memories of looking things up. I read physical books for both pleasure and for reference, but these days I also spend a great deal of time online, particularly when searching for timely or obscure information about a particular subject. Needing to research Linden Park recently, after visiting the park I then spent some time searching the internet. In doing so I stumbled across an old book that was written back in 1987 for the 50th anniversary of Redwood City’s Parks and Recreation Department. Fortunately for me, someone took the trouble to scan the entire book (it’s only 23 pages long) and put it online in PDF form. The Story of Redwood City’s Parks is a great little book that, as you might expect, presents a history of Redwood City’s various parks organized around the 1937 formation and subsequent evolution of Redwood City’s Parks and Recreation Departments. Naturally, I downloaded a copy to read and for reference. From reading this handy little volume I learned that back in 1937 the Parks Department was separate from the Recreation Department, and that the first director of our Recreation Department was Alfred “Red” Morton. Red turned out to be instrumental in the creation of the park that today bears his name, although back when it was first built that park was dubbed Community Park. 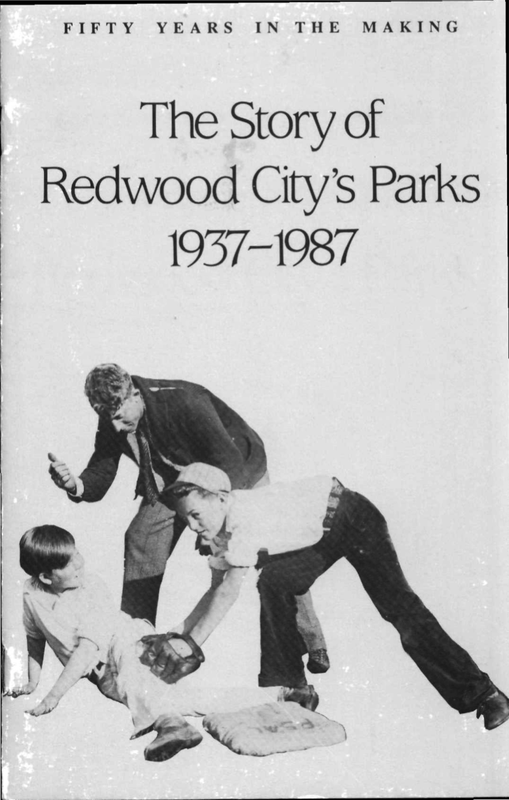 The Story of Redwood City’s Parks takes the reader through the creation of a number of Redwood City’s parks while also narrating the growth of the two departments that, in 1972, would be joined together to create today’s Parks, Recreation, and Community Services Department. It also provides a capsule description of each of the city’s major parks, talking about how and why each park was created and for whom (or for what) the park was named. It even includes a section on our historic Union Cemetery, which today exists under the auspices of the Parks and Recreation Department. These days the Redwood City website devotes a number of pages to Redwood City’s various parks, but most of what you find there is useful but dry: mostly information about where each park is, and what facilities they have. In contrast The Story of Redwood City’s Parks provides some nice historic background on each. It is well worth reading for anyone who is interested in Redwood City history. Our Parks and Recreation department has been working on a couple of projects lately that have piqued my interest, including the afore-mentioned Linden Park and the Magical Bridge Playground, which should break ground later this year at the southwest end of Red Morton Park. I’ve written about the playground project a couple of times now (see Of Parks and Parking); in preparation for doing so I naturally took a walk over to the site. While there my attention was drawn to a nearby building that I had previously been aware of but hadn’t really known much about: the National Guard Armory building at 939 Valota Road. The armory may have an address on Valota, but for all practical purposes it is part of Red Morton Park. To the rear and to one side are houses, but on the other side is the Community Activities Building. The armory building faces into the park; in fact it faces the future site of our Magical Bridge Playground. The playground and the armory will only be separated by the park’s Valota Road parking lot. Although today’s armory may be a relatively ordinary building, it has a somewhat interesting history. Back in 1948 the city gifted the 1.7 acre parcel upon which the building stands to California as a home for an armory (I say “gifted,” but California actually paid Redwood City $1 for the property). In 1950 the State of California then built the 16,500 square foot armory building on the site. 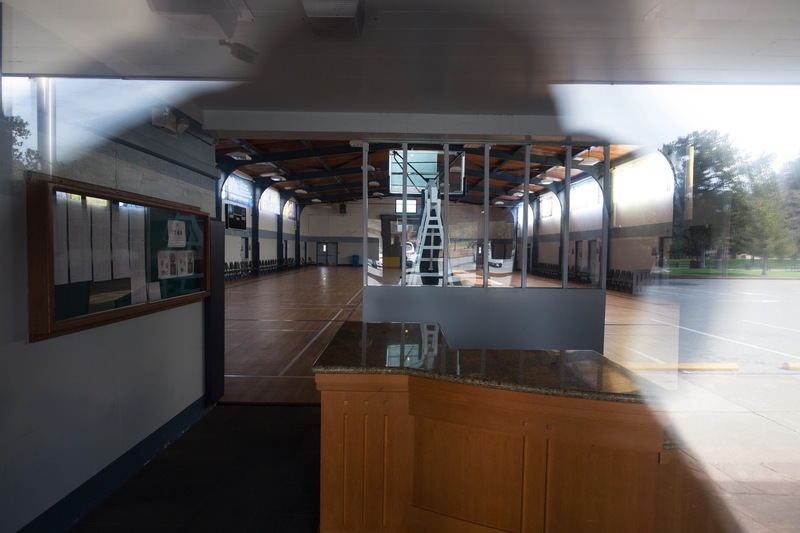 The building consisted of an open drill floor, restrooms, office space, and a kitchen, and was used as a recruiting, drill, and deployment center for military personnel. It was particularly active during both the Gulf War and the war in Afghanistan. Since then, though, the need for active service persons has dropped tremendously, and our armory found itself with only one active member on duty. California wisely saw the value in consolidating services with other armories in the Bay Area, making our armory, from a military standpoint, pretty much redundant. In the past, on very cold winter nights the city has opened the armory to the homeless. Back in 2013, when the Hallmark House Apartments fire displaced some 75 residents, the Red Cross turned the armory into a makeshift shelter for a number of them. And in 1953, when a Douglas DC-6 airliner approaching SFO from Sydney, Australia by way of Honolulu crashed into King’s Mountain, the Sheriff’s department turned our armory into a makeshift morgue for the nineteen persons who were killed (everyone on board: eight crew members and eleven passengers). In 1976 Redwood City tried to purchase the armory back from the state, but California was not interested in selling. The city tried again in 2015, and although the State of California still was unwilling to sell, it allowed the city to lease the armory for a limited time. On July 27 of that year the two agreed on a three-year lease with terms that enable future negotiations on up to two extensions of one year each. And rather than making monthly lease payments, the city agreed to instead make improvements to the building and to the surrounding land equal to the value of the lease: about $350,000 worth. Because the city has full use of the building and the surrounding grounds, the improvements the city will be making will all be to our benefit. They include paving the 20,000 square foot dirt lot next to the armory and turning it into additional public parking (which will come in handy given its proximity to the Magical Bridge playground site), repairing the walkway and planters around the building to improve ADA compliance, redoing the landscaping, painting the building, and various other renovations. Using our armory as a gym, as an emergency shelter, and even as an emergency morgue is an ideal example of turning swords into ploughshares. Buildings like our armory are a great community asset; hopefully we can purchase it back from the State of California someday, but if not it makes sense to continue leasing it for our use. 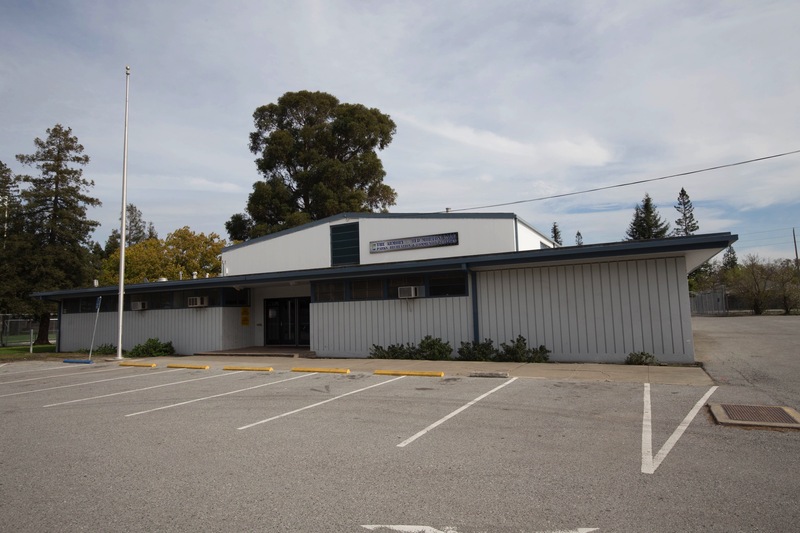 The Redwood City Armory does not appear to be heavily used at this time, but that may well be because of its relative obscurity. Perhaps if more organizations become aware of its existence, they’ll take advantage of it. Following links, either in books or online, can take you to interesting and unexpected places. I skipped from Linden Park to The Story of Redwood CIty’s Parks to Red Morton to Red Morton Park to the armory to a plane crash on King’s Mountain. A journey I never would have expected to take when I started, and one that was pretty much entirely taken by following links. 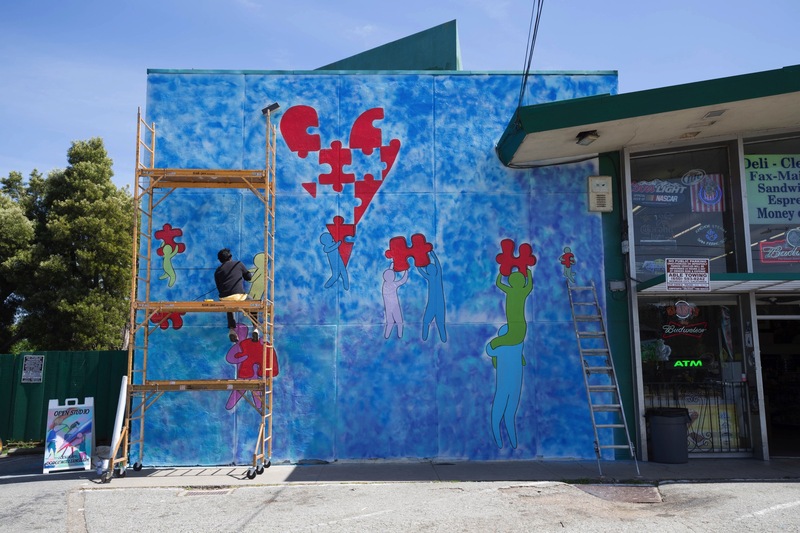 In case you don’t recognize the building, this is the Emerald City Liquors and Premium Wines shop at the corner of Jefferson Avenue and Upton Street; the mural faces Jefferson, so it is pretty hard to miss. The mural is called “Missing Peace,” and since the purpose of the mural is to spur conversation I’ll let you interpret it as you will. I was fortunate to have a nice chat with the artist, Dodge Williams, who among other things remarked upon what a challenge it is to find a suitable location for a mural like this. Fortunately the liquor store’s owner was amenable, enabling this project to go ahead. “Missing Peace” is being done in partnership with the Redwood City Parks and Arts Foundation, of course, but also with the non-profit Mental Health Association of San Mateo County. This last is particularly important: CATA hopes that the mural will raise awareness of the Mental Health Association’s mission, which is to “enrich the quality of life, restore dignity, and reduce homelessness, particularly for those affected by mental illness and HIV/AIDS.” It certainly sounds like a worthy organization, and I encourage you to check them out and consider giving them some support. If you like Dodge Williams’ work, you can always visit his website to see other examples of his work. His studio is at 1502 Stafford Street (about two blocks north of Whipple, on the east side of the railroad tracks); you can drop in and meet Dodge Williams in person. The studio is open to the public on Mondays, Wednesdays, and Fridays from 11 a.m. to 4 p.m.
I’m pretty sure I’ve ridden by the old King’s Mountain crash site while mountain biking up at Skeggs Point/ El Corte de Madera Preserve. As one can imagine not much left other than some obscure pieces of metal. I seem to recall a placard somewhere along the main trail as well. Bit of hike between the armory and the crash site, surprised there wasn’t anything closer. Got me to pull up the old 1948 Google Earth aerial images to see what exactly was nearby around that time. The area around Alice’s looked pretty developed…then again a morgue probably didn’t necessarily need to be close.